Efficient clearance of neurotransmitters from the synapse by dopamine transporters (DATs) is critical to regulating dopamine (DA) signaling in the central nervous system. Despite significant advances in the field, we still lack a complete mechanistic understanding of DA transport events. 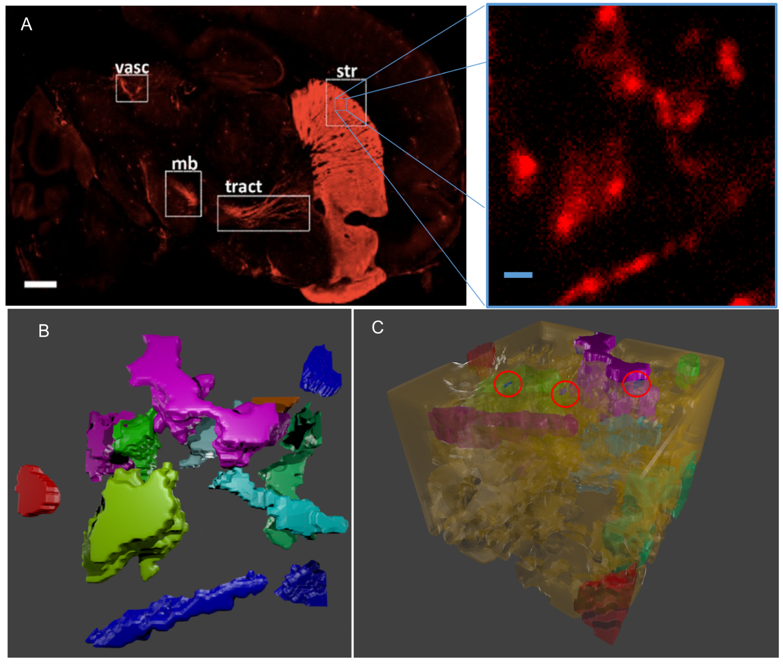 We adopted a multiscale methodology to examine the effects of spatial complexity and firing patterns on DA reuptake by DATs: We used a kinetic scheme from one of our previous studies as input in MCell simulations together with fluorescence images of dopaminergic neurons. 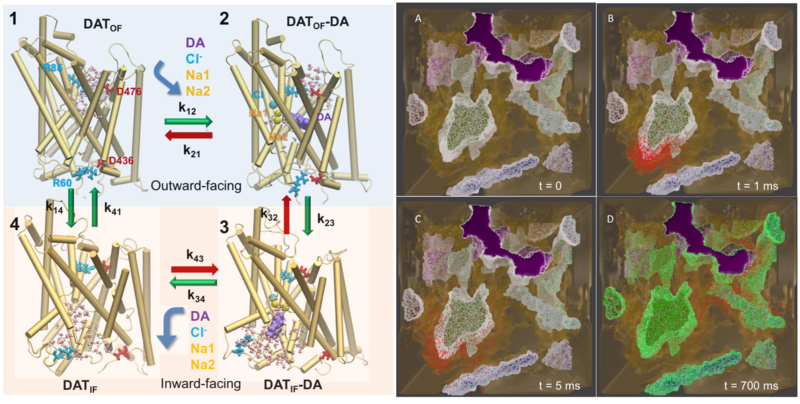 DAT spatial distributions and structural heterogeneities were observed to alter the efficiency of DA reuptake, suggesting that realistic spatial descriptions are required to accurately assess the mechanism of DAT function. Using this model we also explored the effect of neurodegeneration on DA reuptake. Midbrain dopaminergic neurons strongly influence the functions of the striatum including its motor and cognitive functions. Deficiencies in DA signaling can lead to diseases such as Parkinson's disease and attention deficit hyperactivity disorder. DATs are usually located in the extra-synaptic surface of DA neurons and regulate DA signaling by clearing excess DA. The reuptake role of DATs is evident from the increase in EC DA concentration in the presence of DAT inhibitor drugs such as cocaine. DATs inward facing state adds variability in DA signaling dynamics due to limited accessibility for DA binding. Spatial hindrance plays a significant role in DA signaling since the receptor occupancy cannot reach saturation with high frequency input. Triggering low affinity receptors enables excitatory signaling which can only be activated by phasic patterns. Our results highlight the significance of considering the realistic geometry as well as the spatial heterogeneities from experiments as opposed to adopting well-mixed assumptions that overlook the heterogeneities. Top right - Reconstruction and simulation of the morphology and dynamics of DA neuronal axons and dopaminergic signaling. Bottom left - Conformational states visited by hDAT during its transport cycle and corresponding hydration patterns and changes in interactions at intracellular and extracellular gates. Bottom right - Snapshots from the simulation visualized using Blender. Color code: red, DA; white, outward facing DAT; green, inward-facing DAT.